Anthony Woodburn deals in fine antique clocks - 17th & 18th century English antique bracket clocks, longcase clocks and antique barometers, including pieces by GEORGE WILKINS, Frith Street, Soho. A rare and possibly unique Regency musical bracket clock. The case, which stands on ball feet and is surmounted by pineapple final has an ebonised finish and is profusely inlaid with brass swags, quarter foils and floral motives. The clock is complete with a later matching bracket. The circular white enamel dial has Roman numerals and is signed by the maker with his address. The front door opens to reveal the tune selection dial. The single chain fusée movement has a dead beat escapement with a chain fusée musical movement playing three tunes on eight bells above. The tunes are played via a trip at each hour or via a pull repeat at will. By repute, this clock was a gift from the Duke of Windsor to his friend Graham Dilley Esquire, vicar of Lubenham, Leicestershire, a decorated sub marina also known as the ‘Sporting Parson’. Purchased by Albert Odmark from Oliver Bentley, Leicestershire May 1961. 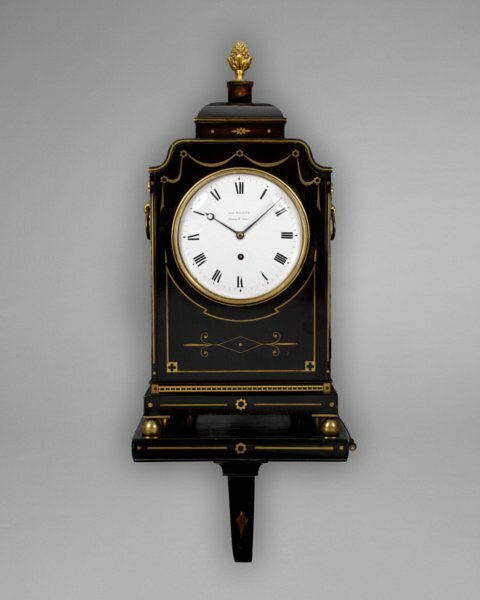 The Albert Odmark Collection of important clocks and watches was sold at Christies London in 2005. George Wilkins is recorded as working in London 1809 to 1824.